I love crostini! Whats not to love about a beautifully crisp slice of baguette topped with something sweet or savory? If you are hosting a hors d’oeuvre party, a small dinner or heck just looking for a tasty snack crostini are always a great option in my book! The combination possibilities are endless and with a little creativity you could probably come up with a handful of ideas with things already in your fridge and pantry. These Caramelized Onions, Thyme & Fontina Crostini are a great go to! The onions are so tender and sweet, they pair perfectly with the fresh earthy thyme and the fontina cheese. There are a couple little tricks here that really make these crostini special. The first one, after the baguettes are toasted in the oven I rub a clove of garlic and rub each piece. The garlic actually just melts into the crostini and that garlic flavor is subtle but there. I love fontina cheese! It is a classic creamy, buttery Italian cheese that melts wonderfully. The onions, oh those onions! Thinly sliced vidalia onions are slowly cooked in a combination of butter and olive oil, along with fresh thyme, salt, pepper and a little sugar. A little patience while these caramelize to perfection will be so worth it in the end, I promise! Lets start with the onions because they do take some time to cook properly. In a large sauté pan over medium low heat, add the butter, olive oil and onions. You want to cook these nice and slowly, they will take about 45 minutes to get there. Stir every 5-10 minutes. You want the natural sugars in the onions to caramelize not burn, you are looking for a soft tender and golden end result. At around the 35 minute mark go ahead and stir in the water, sugar, salt and pepper. Stir and continue to cook for approx 10-15 minutes. While the onions are cooking go ahead and place the baguette slices on a parchment lined baking sheet and pop into the oven for about 15-20 minutes or until lightly golden and crisp. As soon as they come out of the oven, rub one side of all the crostini with a garlic clove. The garlic will melt right onto the bread. Keep the crostini on the baking sheet. Add a slice of cheese to each of the crostini and pop back into the oven for a few minutes or until the cheese is melted. Top with the caramelized onions and garnish with some fresh thyme leaves. You pretty much had me at caramelized onions! These look absolutely fabulous, and I might keep these in mind for when my in-laws are next in town. These seem right up their alley. Thank you so much Maggie!!! They are so simple and the flavors, just YUMMM!!!! Hope you do give them a try and enjoy them as much as we did! Ok this recipe has some of my favorite things: caramelized onions with thyme, fontina cheese, garlic and REAL BUTTER!?!?!?! This is wonderful. YES YES & YES!!! All around awesomeness right?!?! Not only did I use real butter, it was my fav Plugra European Style butter!!! yum yum yum! I made almost this exact same thing a few weeks ago. Delicious, right? Oh goodness, these crostini sound amazing! I’m all in, if it has cheese and caramelized onion. I agree!!! Cant go wrong with that combo! Delicious!! Fantastic! I adore caramelized onions which combined with fontina cheese has me already drooling. I can only imagine what an amazing crostini this topping must make! I admit, I drooled just a tad as I enjoyed these! Had to stop myself after 3 so as not to ruin my appetite for dinner. Hope you give these a try! I love all kinds of crostini, and this one looks fabulous! I’ve pinned it to my appetizer board! Thanks so much Kim! Hope you give them a try! They are addicting! G’day These look and sound delish too! Love the simplicity! Joanne, thank you so much! I agree… and recipes like these are great proof that tasty food does not have to be complicated. 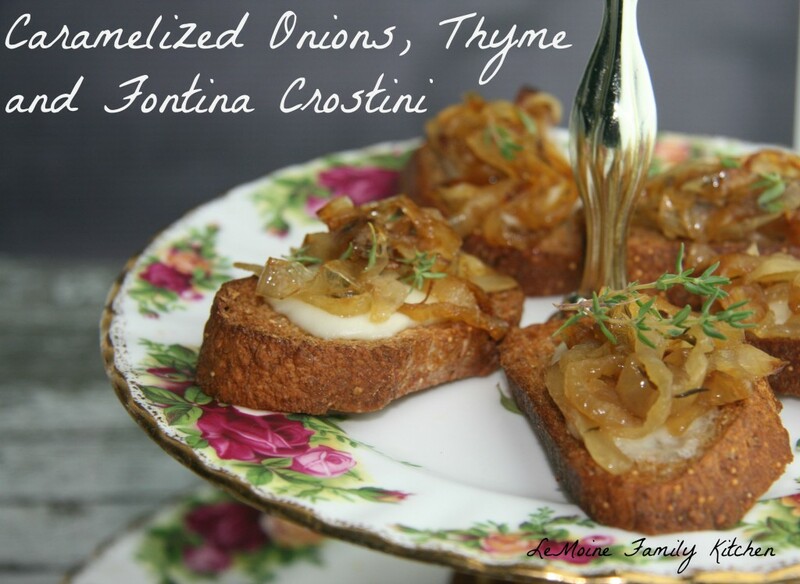 I love this idea for Caramelized Onions, Thyme & Fontina Crostini! I can’t wait to try this!! !